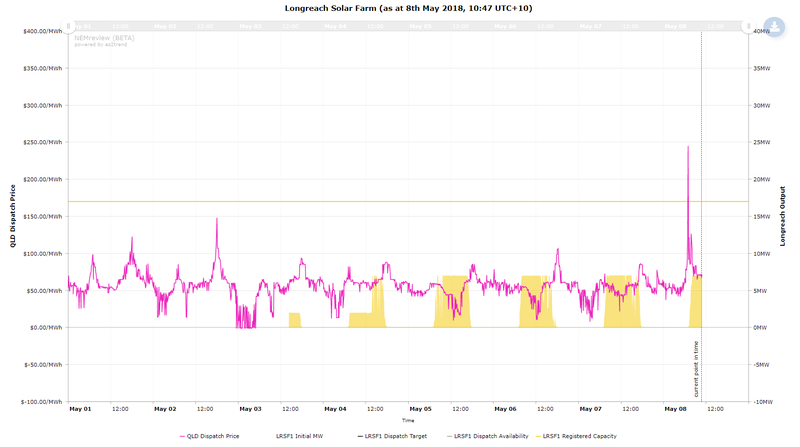 The solar rush continues, with two new solar farms at Longreach in Queensland and Manildra in NSW start exporting to the grid. Two more solar farms have joined the grid in New South Wales and Queensland, joining the rush of connections of new solar farms across the country. 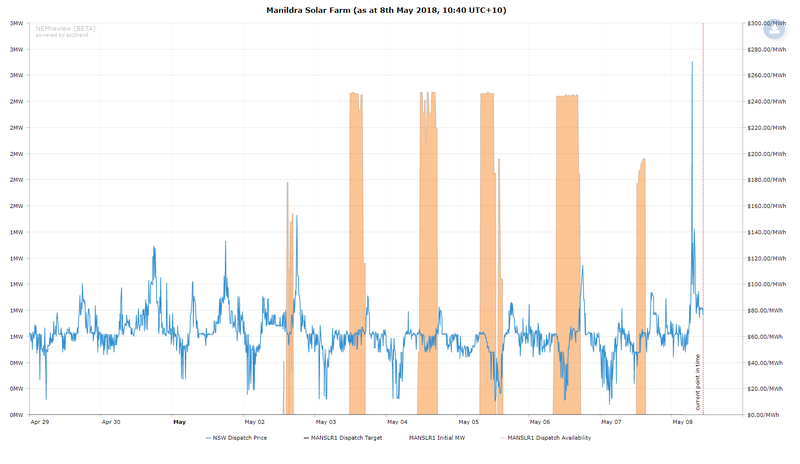 These two graphs above and below – courtesy of Paul McArdle at WattClarity – show that both the 41MW Manildra solar farm in NSW and the 15MW Longreach solar farm in Queensland have begun exporting to the grid, albeit in small quantities. This is no doubt part of the commissioning phase for both projects, which join new connections in Griffith and Parkes in NSW, in Barcaldine and at Sun Metals in Queensland, in Peterborough in South Australia, and Ganawarra in Victoria. They are among a group of solar projects that began construction last year as the renewable energy target finally started to take hold, with some 2GW of solar capacity expected to be completed and connected this year. Both Manildra and Longreach were among the winning project in the large scale solar round funded by the Australian Renewable Energy Agency. The Longreach project, located near the iconic town that is regarded as the birthplace of Qantas, was proposed by Canadian Solar and received a $1.3 million grant, while Infigen Energy’s Manildra project was allocated $10.9 million. Both projects are using single axis tracking technology. The key data set for the Manildra solar farm, located between Orange and Parkes in central west NSW, and which is using First Solar thin film panels, is shown to the right. The completion of the two solar farms means that nearly half of the 12 solar farms funded by ARENA are now complete, with the rest well under construction. Love this site, just a bit of feedback from what I’ve noticed on a couple of articles. Graphs like these are in a resolution that’s too low to read the axis labels. I don’t know if you have the option for uploading them in a higher resolution or at least including a link that makes them readable? It could be browser related, but if I do that the text is too blurry to read (the resolution is too low). When I download it the image is 550×319 which isn’t enough to read text of that size. Unfortunately that doesn’t work either as the images are at a too low resolution to read even when zooming in.